In order to maximize his earnings and enhance his living standards, man has always attempted to improve his processes, methods and tools in order to improve the productivity of his resources. That continued effort gave birth the joint of Industrial Engineering and Production Management. 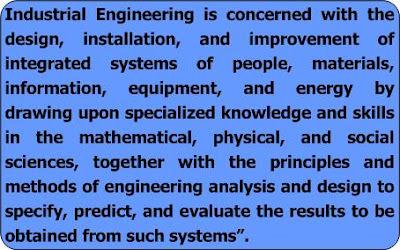 About the concept of Industrial Engineering, some books and autors tell us that Industrial Engineering is concerned with the design, improvement and installation of integrated system of men, material and machines for the benefit of mankind. 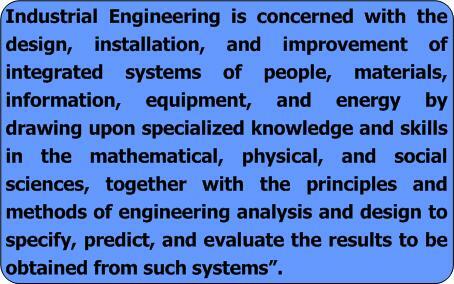 It draws upon specialized knowledge and skills in the mathematical and physical sciences together with the principles and methods of engineering analysis and design to specify predict and evaluate the results to be obtained from such systems.